Hi! Now that I have made the switch to natural sweeteners, I have noticed that my grocery bills have increased. Since I have a sensitivity to cane sugar I have an incentive to purchase the natural alternatives, but I want to be informed about which ones to use as substitutes so I don’t break the bank. And for people who are trying to cook with healthier ingredients, it may be helpful to see which ones are more cost-effective. So the economist in me felt the need to do some investigating, particularly to determine which options are the least expensive per unit while accounting for the relative sweetness. Break out the spreadsheets – sensitiveeconomist is doing some calculations! First I gathered all of my favorite natural sweeteners and entered in the costs and net weights into the spreadsheet. By dividing these two numbers, I obtained a per unit cost. Next, I compensated for their sweetness ratios by multiplying the per unit cost by how much one uses to substitute for one cup of cane sugar. For example, I use 2/3 cup honey for 1 cup of cane sugar, so I multiplied all of the honey options by 2/3. The results are displayed graphically in the chart. No wonder people tend to use cane sugar – it’s quite inexpensive. The least expensive natural sweetener is a store brand non-organic clover honey. However, an interesting find is that local honey and organic agave, when bought in bulk, offer relatively inexpensive options, and can be cheaper than typical organic store and national brand honey. 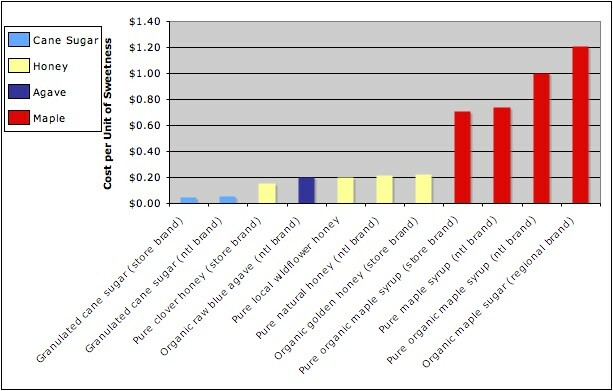 Maple sugar and syrups are the most expensive. My verdict? I am going to buy store brand clover honey for baking since there is a cost savings and there should be no effect on the taste. In addition, I’ll look for local honey and organic agave nectar in bulk for baking and drizzling on top of foods, since they have long shelf lives and are quite tasty. I’ll save the maple for special occasions. I look forward to hearing how you choose between different foods at the grocery store. Don’t be afraid to pull out a spreadsheet for some extra analyses. Ah, the power of spreadsheets! This entry was posted in Economics, Organic on a Budget and tagged Economics. Bookmark the permalink. Thank you so much for doing the analysis for us! I love seeing the results so that I can decide if it’s worth it to use a particular sweetener or not (whether the specific flavor is worth the extra cash!). 100% agreed the power of spreadsheet. Happy day after the 4th!! !